The first time I was introduced to Ralph Wilson, right off, he asked me about the business picture in Buffalo, as if I was some sort of expert. Over the years, when I would see him at the NFL Owners meetings or other league functions, that was always the first topic that came up. That seemed to be something that was always on his mind. Ralph had some great friendships among the media – not me – although I never had a problem dealing with him. A close friend was the late Will McDonough of the Boston Globe and CBS Television. They always had a tennis date at the annual NFL meetings. Will, it seemed, could call Ralph at any time and get the scoop on NFL business from him. One year, shortly after I checked in to the Arizona Biltmore for the annual meetings – it was a Sunday evening – there in the lobby entrance, stumbling out of a cab and laughing like a couple of school kids were Ralph and Will. They had played tennis, gone out for dinner together, and, I guess, ordered an extra bottle of fine wine. For some reason I got a kick out of that. It’s always been assumed that Ralph blocked the election of Lou Saban and Cookie Gilchrist from inclusion on the Bills’ Wall of Fame. I don’t recall an outright Wilson veto, but on more than one occasion, Ralph would explain why he felt Saban did not deserve to be honored. It was because Lou had walked out on the team twice, and Ralph viewed that as disloyalty. Gilchrist was a giant in Bills history. Some of us on the committee questioned his relatively brief time with the team and the issues surrounding his departure. The committee never tried to buck Mr. Wilson on Saban and Gilchrist. The sentiment seemed to be: It’s his Wall of Fame. Besides there were several other deserving candidates, so let’s move on. On two occasions, Ralph came to the Wall of Fame committee meetings with a candidate in mind. First, it was trainer Ed Abramoski. Ralph called us out of the room to talk about it because Abramoski was present as a member of the committee. He got no argument from us. On another occasion, following the season when Marv Levy had undergone his prostate surgery, Ralph proposed Levy’s enshrinement. It was an easy choice. With Marv it was only a question of when his name would go up on the wall. Ralph thought that was the time and the committee went along. When it came time for Bill Polian’s selection, Mr. Wilson participated via conference call from his home in Michigan. He readily went along with the committee’s wishes on Polian. In fact, I think he seemed to welcome it because, as far as the public was concerned, it closed a chapter of discord in Bills’ history. Milt Northrop – Milt Northrop joined The Buffalo News in December 1967 as a copy editor in sports department. 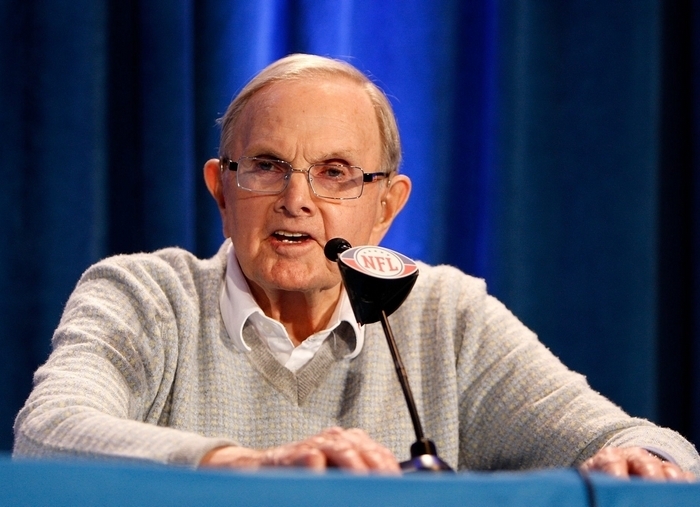 He has reported on the Braves, the Bills, the Sabres beat and bowling in the years since.